As responsible dog owners, we all want to do the very best we can when it comes to dog nutrition. 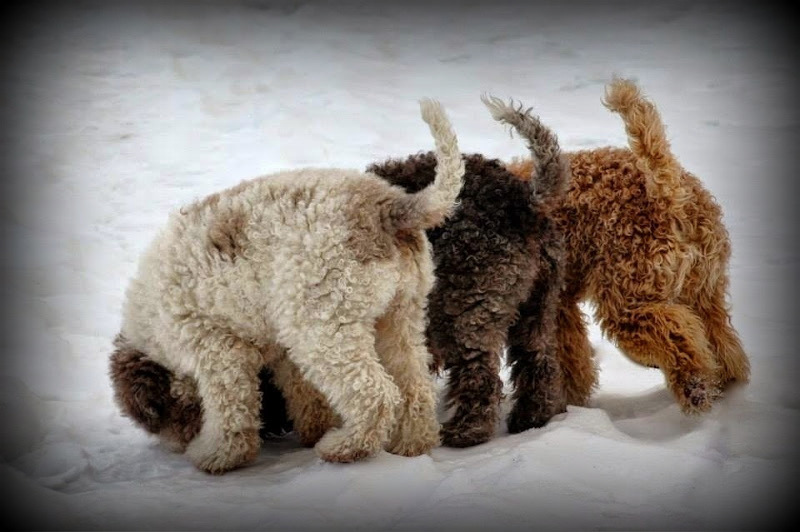 In choosing what to feed your dog, it is important to remember that various breeds, age of the dog, activities the dog is involved in, chronic health issues with the dog, and many other factors need to be weighed when deciding on a nutritious feeding plan for your Lagotto. We all hear the horror stories about the things that are in various dogs’ foods. One such article called “The Shocking Truth about Dog Food” and posted in the Earth Journal in 1990, brought to light the way many dog foods are made and the ingredients in some commercially made dog foods. Rumors and hearsay can cause a lot of confusion and it is our hope to give you some information and resources so you may be better informed. With increasing recalls, the need for consumer advocacy has increased and there are more organizations monitoring and testing dogs foods for ingredients and quality. The Whole Dog Journal (http://www.whole-dog-journal.com/topics/dog_food.html) publishes a yearly list of food they would recommend. There is also an animal advocacy website called “The Truth about Pet Food” (http://truthaboutpetfood.com/) solely devoted to issues with pet food quality. They also publish a list of foods they consider safe, whether it be dry, canned and raw. In order to obtain the food lists from either the Whole Dog Journal or the Truth about Pet Food, you must either subscribe or pay a user fee. To help you better identify the regulatory guidelines, basic nutritional needs, and knowing what the ingredients are in pet foods, below are just a few of the many websites you may find of interest. Remember, while it is very important to do your research, please consult your Veterinarian if you have any questions or concerns about the nutritional needs of your dog.